Arts Umbrella is thrilled to unveil its 2019 Expressions Festival theatre lineup, presented by Coromandel Properties, running May 17–25 at Waterfront Theatre on Granville Island. Showcasing some of Vancouver’s most talented young artists, the annual festival boasts a curated selection of theatre and musical theatre classics. 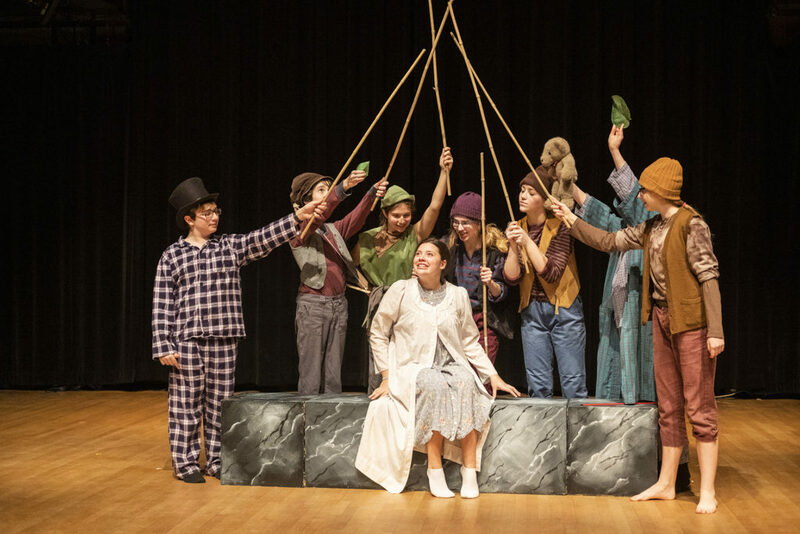 The festival features performances by students in the Pre-Professional Program: Arts Umbrella’s Junior and Senior Musical Theatre Troupes, and its Junior and Senior Theatre Troupes. The 2019 Expressions Festival in Dance, Theatre, and Visual Arts is presented by Coromandel Properties, a leading real estate developer with a strong connection to family, community, and the environment. This year audiences will be treated to a selection of family-friendly programming, including the fairy-tale classic Peter Pan, the whimsical musical rendition of James and the Giant Peach, the mythical Animal Farm, and the magical tale of Into the Woods. Arts Umbrella Pre-Professional theatre programs offers students the training and tools needed to pursue a career in theatre. Renowned local industry instructors guide students in a process unique to Arts Umbrella. At Expressions Festival, emerging artists perform on a professional stage and learn about all of the facets and operations behind bringing works to life. In 2018, Arts Umbrella announced it will be moving into the South Building of the former Emily Carr University of Art + Design. The new building will more than double Arts Umbrella’s net square footage, ensuring innovative spaces and technologies, increased access to arts education programs for children and youth, and expanding its significant and ongoing contribution to the creative economy. By 2021, Expressions Festival will take place in the onsite 145-seat professional theatre. Peter and his mischievous fairy sidekick Tinkerbell visit the Darling children nursery late one night and, with a sprinkle of pixie dust, begin a magical journey across the stars that none of them will ever forget. In the adventure of a lifetime, the travelers come face to face with a ticking crocodile, the lost boys, a band of bungling pirates and, of course, the villainous Captain Hook. When James is sent by his conniving aunts to chop down their old fruit tree, he discovers a magic potion that results in the growth of a tremendous peach… and launches a journey of enormous proportions. Suddenly, James finds himself in the center of the gigantic peach, among human-sized insects with equally oversized personalities. After the peach falls from the tree and rolls into the ocean, the group faces hunger, sharks and plenty of disagreements. Thanks to James’ quick wit and creative thinking, the residents learn to live and work together as a family. George Orwell’s stinging allegory to communism is brought to life on stage. Old Major’s dream comes to fruition after the creatures emancipate themselves from the cruel mastery of a human owner during their triumphant rebellion. His dream inexorably turns to a nightmare of disillusionment in which the other animals discover themselves now subject to the rule of even more ruthless autocrats: the greedy, cunning pigs. Meet the beasts whose prototypes continue to dominate news headlines. Animal Farm wrings the emotions, leaving audiences shaken with the tale of a tragedy that happened in a mythical barnyard far away but could happen in our own backyard. James Lapine and Stephen Sondheim take everyone’s favorite storybook characters and bring them together for a timeless, yet relevant, piece. The story follows a Baker and his wife, who wish to have a child; Cinderella, who wishes to attend the King’s Festival; and Jack, who wishes his cow would give milk. When the Baker and his wife learn that they cannot have a child because of a Witch’s curse, the two set off on a journey to break the curse. For Coromandel Properties, family, community, and the environment are at the core of every successful home. A real estate developer that is proudly Chinese, their heritage inspires them to create spaces that bring together families of all kinds. Coromandel doesn’t just build homes, they build homes that support communities—contributing to local organizations that support families, the arts, and the environment.